Wash and dry the face. Apply concealer as needed. 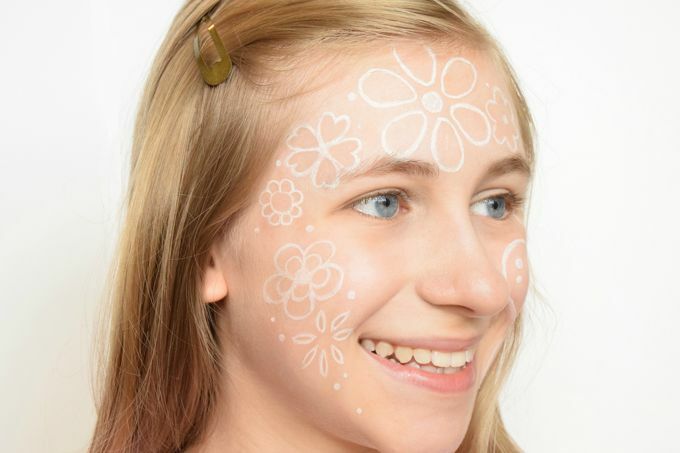 Use the white eyeliner to draw outlines of the shapes you want to paint on the face. We used flowers and a butterfly. You want to be able to see the designs from the front. When you start drawing, be sure you’re looking at the center of the face. You can use stencils to make the flowers. 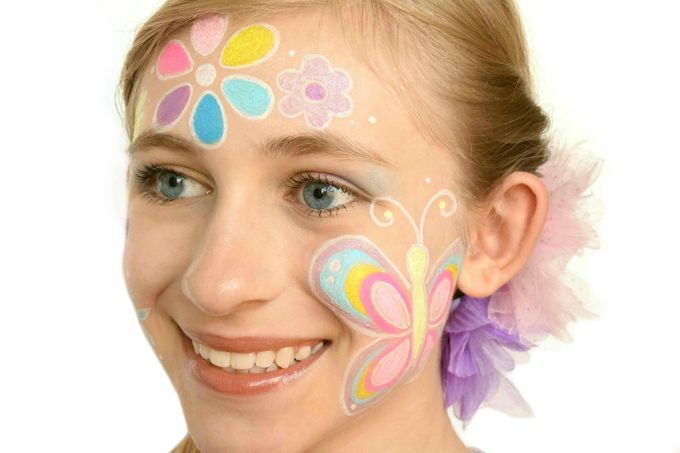 Draw the butterfly outline on one cheek. Add a large flower on the opposite forehead. Add a medium flower on the middle of the opposite cheek. Add smaller flowers around those as you would like. Add a few small dots on the outside of the designs. To erase a mistake, use a wet cotton swab to wipe it off. Go back over all of the white lines a second time to make them darker. Wait for the white outline to dry. So when the colored paint is added it doesn’t combine with the white. The paint stays very wet. So advise your “model” not to touch her face or it will smear. Use small paint brushes (not the applicators enclosed in the kit). Paint inside the white lines as if you were filling in a coloring book. If you make a mistake, use a cotton swab to wipe it off. 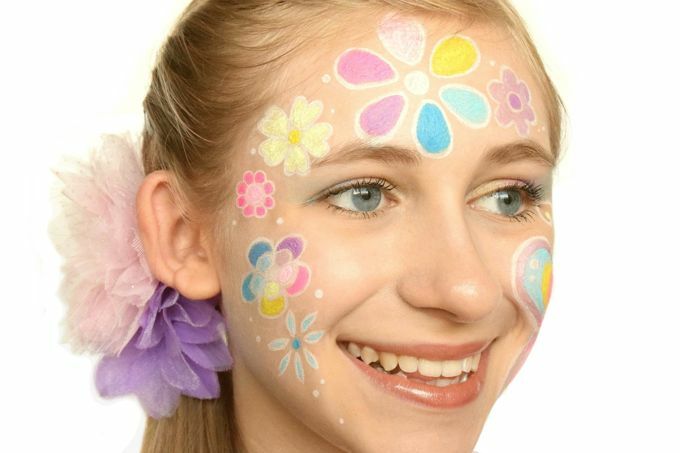 I painted the butterfly, large flower on the forehead, and medium flower on the cheek in a rainbow order. Then I painted the other flowers with their two hues like light and dark yellow, pink and hot pink, etc. Next time I would try adding the clear glitter gel on top to give it some sparkle. I applied mascara to the eyelashes. Then I brushed eyeshadow on the eyelids using the colors yellow, pink, purple, and blue. I put lipstick and lip gloss on her lips. Attach false eyelashes if desired.